With Angela Sison of Conrado. 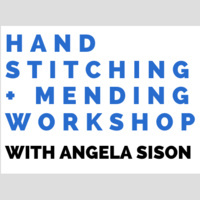 Learn basic hand stitches to sew a patch, fix a button, repair a tear. (Please bring an item to work on.) Fabric scraps/tools provided. No experience necessary, all are welcome. Ms. Sison has worked in the fashion industry in New York, California and Paris. She is the owner of womens sustainable clothing brand Conrado. Sponsored by the Friends of the Chilmark Library.